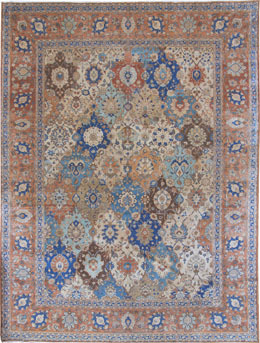 Tabriz means many things to rug enthusiasts: classical antique Persian carpets of the 16th century now in museums, decorative medallion carpets from the 19th century popular with designers worldwide, fine quality silk rugs as much wall hangings as floor coverings, and medium-priced goods for the middle market. The Persian carpet revival began in Tabriz around 1870 and Tabriz carpet merchants were instrumental in the renaissance of the craft throughout Iran. Because Tabriz has always been an important Persian industrial center. Tabriz carpets are always regularly woven, well drawn and evenly dyed. There are no loose cannons on the Tabriz ship of weaving. 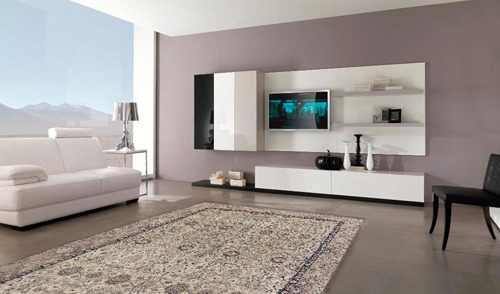 There is a Tabriz carpet for any pocketbook, any decorative style, any room, any taste. This is a grade quality of antique Persian carpet as much as an actual master weaver. Medallion designs on open rust red grounds are a specialty, but the type extends to highly elaborate allover classic Persian patterns. Most pieces are room size or larger, few are scatters and even fewer are in silk. 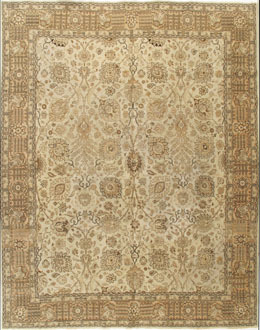 Hadji Jalili style Tabriz carpets are all antique, woven between 1880 and 1910. The pile is velvety, but firm and resilient, the color palettes are slightly mellow, but complex, and the draughting is exceptionally exacting. When one thinks of an iconic Tabriz, Hadji Jalili carpets come first to mind. The Benlian firm was active in Tabriz before WWII and wove good quality room size rugs, now attaining antique Persian rug status primarily with close interpretations of classical archetypes. The colors are good, the piles are short and the execution is precise.